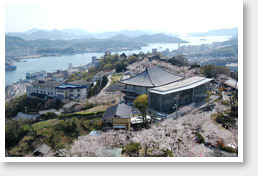 With this park being the most popular sightseeing spot in Onomichi, visitors to Onomichi first come to see "Senkoji Temple"; "The Path of Literature" where you will find many stone monuments inscribed with famous authors' works; and "Onomichi City Museum of Art" which are all located here. Although you can enjoy all seasons here, spring is the best time to visit. More than 1,500 cherry blossoms burst into full boom in the garden that is chosen as one of the "Top 100 sites of Beautiful Cherry Blossoms". The appearance of cherry blossoms seems like clouds floating just above you. From the observatory at the top of the park, you can enjoy a 360 degree panorama view of many islands in the Seto Inland Sea as ferryboats depart and return to the Onomichi waterway. You can also enjoy the night view from here that is chosen as a "Top 100 Night View". 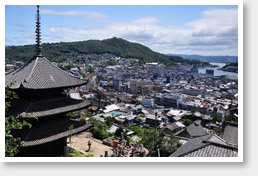 This tour is about a 3 km stroll of roads that start from Onomichi JR Station to the eastern side of town. 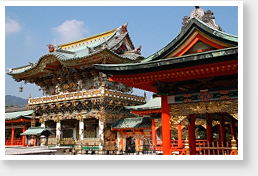 Walking on stone paved streets, you will reach Kairyuji Temple. This course is recommended not only for temple enthusiasts, but also visitors who would like to enjoy some beautiful scenery. Walking through narrow alleys, stairs and slopes, you will experience the old part of town and be welcomed by cats. Even if you lose yourself on one of the complicated narrow roads, you will discover the quaint, traditional scenery of Onomichi. You will naturally be greeted from passing people in alleys. This will make you feel the heart of Onomichi. Along the shopping street that lies east to west about 1.6km in central Onomichi, you will find a wide variety of shops such as ramen shops, Onomichi yaki shops, old-fashioned coffee shops, souvenir shops of Onomichi Hanpu (canvas) and many more. 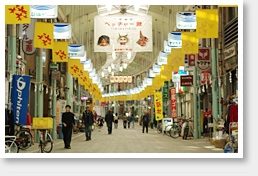 There are a lot of alleys that criss-cross in the manner of a fishbone which connect to the main shopping street. Each of those alleys brings you to different faces of Onomichi when you explore down them. You will often meet wives of fishermen called "Banyori-san" pushing their carts to sell fresh fish in the morning. This bridge connects six islands of the Inland Sea or so-called "Aegean Sea in Japan" between Honshu and Shikoku. You will see breathtaking views from this bridge. You will especially be impressed by dotted islands and the setting sun among the islands. You can also enjoy walking across the bridge or riding a bicycle and feeling the breeze from the ocean. You can rent a bicycle at the terminals. 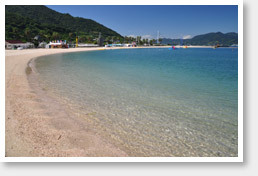 The seaside resorts and campgrounds to be found on each island are filled with people in summer. The highest mountain on Mukaishima Island is Mt. Takamiyama which is designated as a National Park. The view of the Shimanami Sea Route and islands of Seto seen from the observatory are unforgettable. 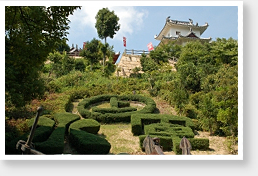 Since it takes only 20 minutes by car from the central area, you can easily take this trip. 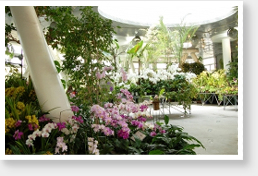 Mukaishima Orchid Center is located at the foot of Mt Takamiyama. You can see orchids that are grown in greenhouses and take a look at the wide variety of orchids being cultivated. You can also get great advice for growing your own orchids. Since Innoshima Island was the main territory of the "Murakami Pirates" in the Middle Ages, you can find their historic sites here. Both "Innoshima Suigun Pirates Castle" and the "Konrenji Temple" that was the pirate's family temple are must see places. Walking around the island to see the ruins of the castle will be most enjoyable. Another tourist spot is Honinbo Shusaku Go Memorial Hall. (Go is Japanese chess) He is one of two greatest Go players in history. You will learn about his carriers and character. Go is Onomichi's city game. Kosanji Temple which is the symbol of Setoda is known as "Mother's Temple" since this temple was built to show the founder's gratitude to his mother. Various structures resembling some of Japan's finest architectural monuments were used to build this temple. The gorgeous building and the amazing "Miraishin no Oka" or "Hill of Hope" which is made of marble are fascinating sites. There is a huge marble object that was brought from Italy to pique your interest. "Mitsugi Greenland" has lots of outdoor recreational equipment and is located near a dam. It is an ideal place for camping, barbecues, athletics, tennis, and other outdoor fun. You can also enjoy bass fishing at the dam. 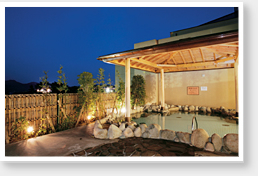 After enjoying outdoor activities, visit "Natural Spa Fureai no Sato" and enjoy a hot spa. There are many kinds of spa including "Plasma bath" that is the only such bath in the western Japan. You can completely relax yourself in this hot spa. It is recommended to visit "Entsuba Memorial Park" if you are interested in art.